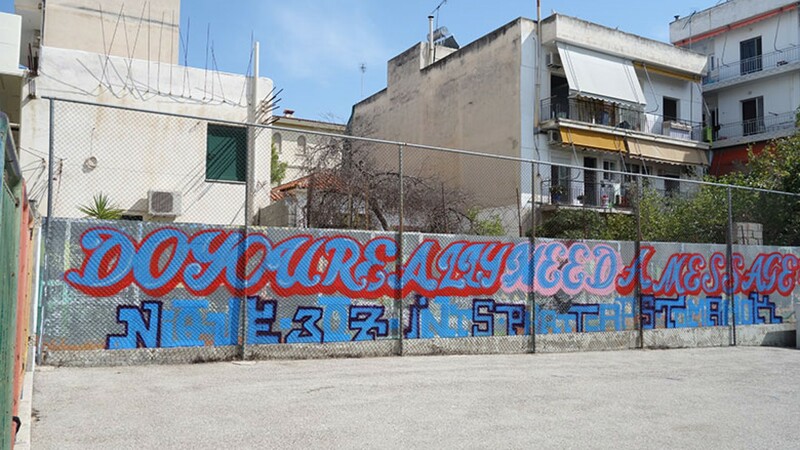 On a bright, autumn Saturday afternoon, on a patch of pavement in front of the rather humdrum environment of a retail shopping park a few miles from Athens airport, two young men sporting hoodies and scruffy facial hair are putting the finishing touches to a stretch of canvas. Clutching spray cans and rolls of masking tape, they step back from their work, revealing a mishmash of abstract, graphic designs in bright yellows, greens and pinks. Around them, a crowd of people applauds, celebrating the intensity and energy that has gone into their performance. The two men smile sheepishly, unused to working in front of an audience, or in full view. 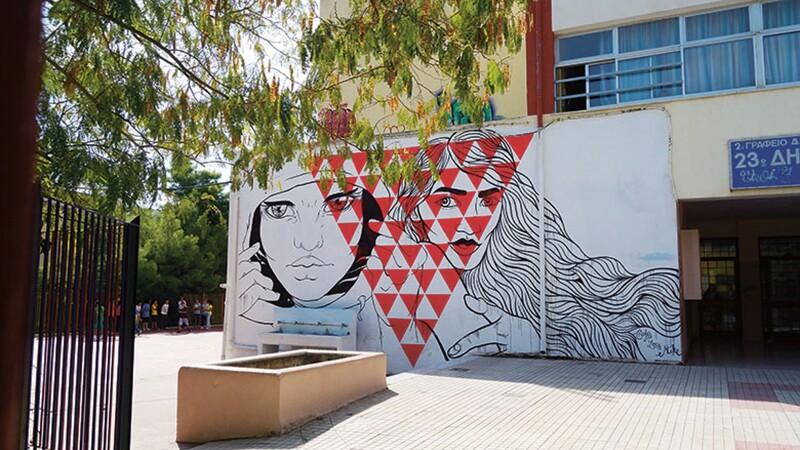 Both are street artists, who’ve spent the past few years covertly putting their marks and designs on walls and buildings without the owners’ permission. 24-year-old ‘Opium’, all brown cords, straggly beard and Vans, is an Athens native, while his half-French half-Greek friend, ‘Cacao Rocks’, is 25, and sports glasses with fashionable electric blue frames, and a moustache that twirls up at the ends. Now, they are freely indulging in their craft in public. of its high schools for the purpose. 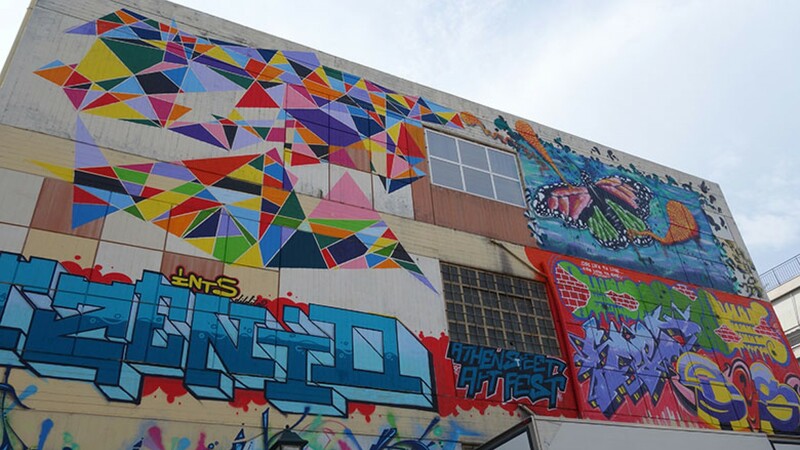 “I made the point to the mayor that getting the walls decorated in art – for free – would save them thousands in maintenance costs!” he laughs. There are primary- and pastel-coloured graphic abstract shapes, more recognisable forms, and images of people – from a side profile of what looks like an African warrior, to a woman in a ’50s-style circle skirt doing swing dance. Some designs are more playful than others; a massive bunny sporting phallic-shaped ears and chewing a carrot, Bugs Bunny-style, by local artist Billy Gee, adorns one wall. 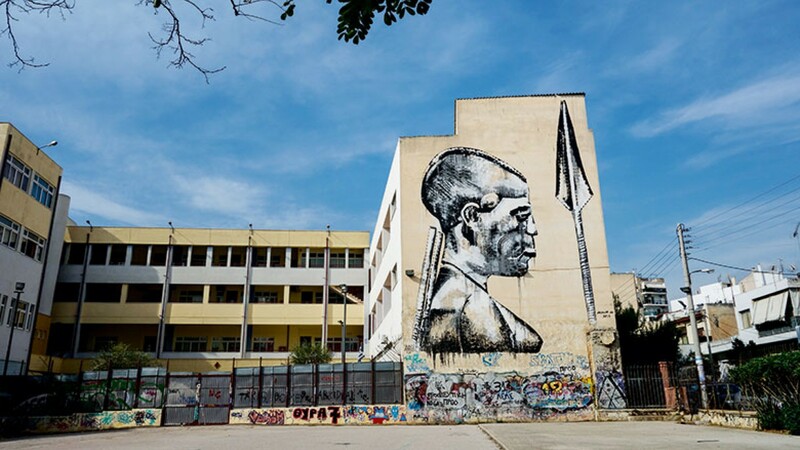 Others have more of a message; a Swiss artist, BANE, has created a powerful image on the side of a different school. 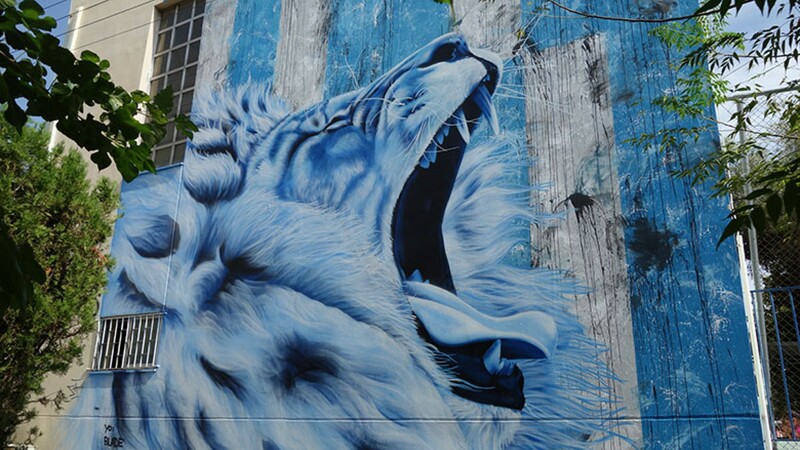 Against the blue-and-white backdrop of the Greek flag, a giant lion snarls, exposing its sharp teeth. In the upscale neighbourhood of Kolonaki, where designer boutiques rub shoulders with five-star hotels, is high-end art gallery Aenaon. All cool cream marble and spotlit canvases, its owner and dealer George Tzilalis, an elegant man in his sixties, hosted his first ever show featuring street art in May. The artists who took part included BTOY, who uses airbrush techniques to create beautiful, colourful pop-art style portraits of women, and FKDL, a French artist who works with collage. “Smaller artworks can sell for around €1,200 [£950],” says George, “larger ones for €2,000 [£1,500].” It’s a long way from spraying images on to shopfronts under the cover of darkness. 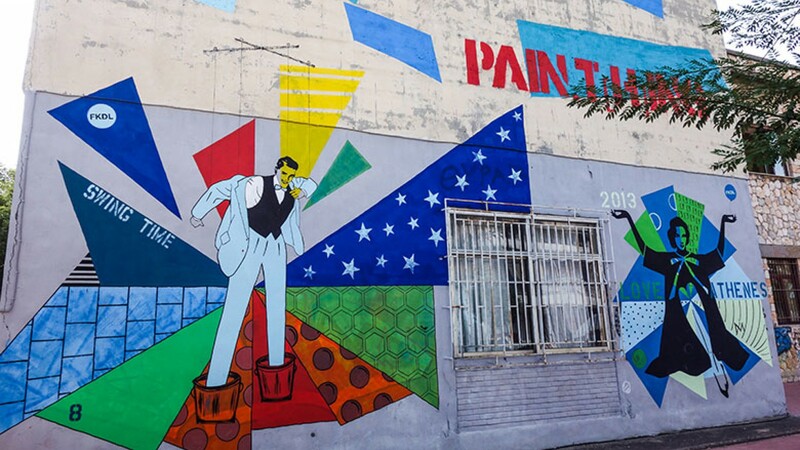 These days, thanks to their higher profiles, street artists are landing commissions for bar, hotel and restaurant interiors, as well as for private residences. 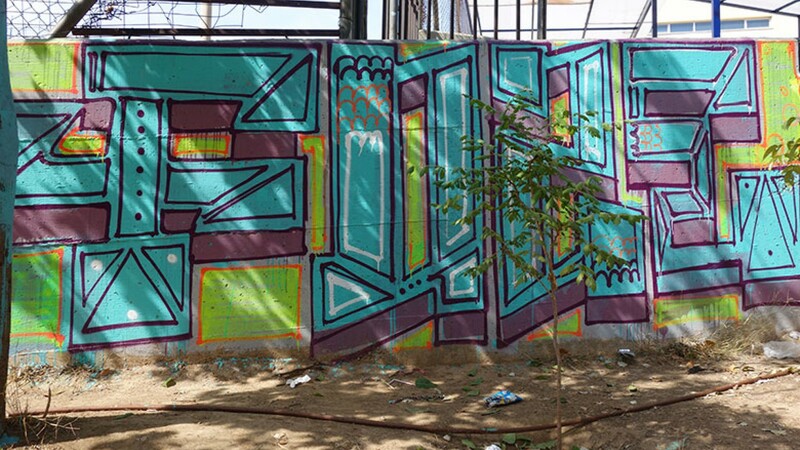 art than just tagging and graffiti. On the outskirts of achingly fashionable neighbourhood Gazi – named after the local decommissioned gasworks, which in the last couple of years has sprouted nightclubs and neon-signed bars like mushrooms – one huge wall next to a main road is covered with a massive painting, which is by local artist iNO, a fine art graduate, like so many of the street artists. The painting is a massive eye watching over a robotic figure, which is trying to run away. It’s powerful and disturbing at the same time, and it reminds me of something Andreas said earlier: “Street artists are not here to entertain. We’re here to stir things up.” Job done. 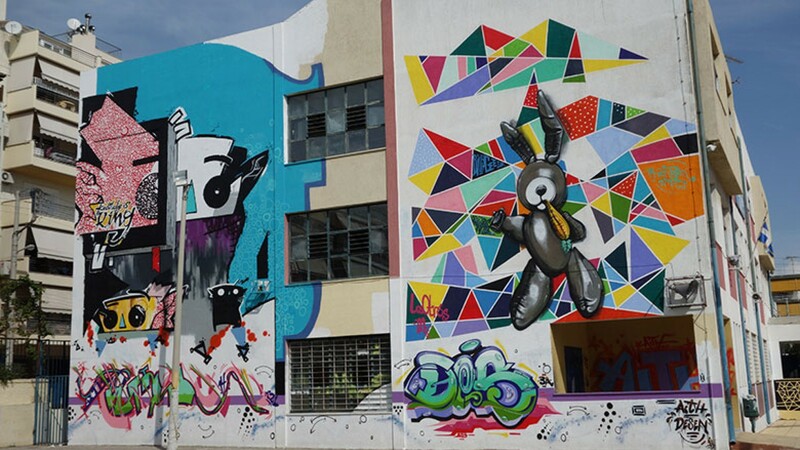 To find out more about the Athens Street Art Festival, visit athensaf.eu. Its forthcoming app will detail all the sites the artists are working on, so you can visit them yourself. For a tour of street art in Monastiraki and Psiri, visit dopios.com/experiences/greece/athens/1076-street-art-tour-in-monastiraki-and-psiri-area. Tailored off-the-beaten-track tours with Athens Insiders are available.